In 2010, the Ktunaxa Nation traveled to the BC legislature in Victoria to deliver the Qat’muk Declaration. Qat’muk is the Ktunaxa name of the lands that include the area of the proposed Jumbo Glacier Resort. It is within the core of the Ktunaxa Nation territory and we understand that it is the home of grizzly bear spirit. 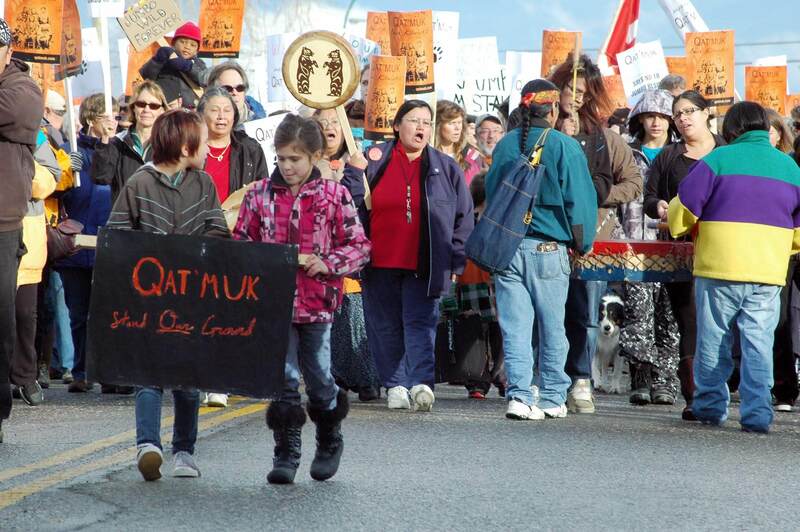 The Declaration outlines the spiritual significance of Qat’muk and is an expression of Ktunaxa sovereignty and stewardship principles. Read the Declaration here. Read this 3-part interview series with ʔaq̓am Chief Joe Pierre on the importance of Qat’muk to the Ktunaxa. The Ktunaxa Nation appealed the BC government approval of the Jumbo Glacier Resort, alleging that their religious freedoms were violated when the government approved a massive ski resort development in the heart of Qat’muk, their sacred territory. The case was heard in the Supreme Court of Canada in December 2016. The disappointing ruling confirmed that our legal system does not yet recognize and protect the sacred nature of land, fundamental to indigenous spirituality. The decision did not, however, give the green light for the project to proceed. In March 2017, we delivered a petition to the transboundary Ktunaxa Nation with 61,526 signatures in support of the Qat’muk Declaration and permanent protection of the Jumbo Valley. We later presented this petition to the BC government. Now is the time to come together and support the Ktunaxa Nation. It is time for the federal and provincial governments to come to the table and work with the Ktunaxa to protect Qat’muk once and for all.